I’m still tripping over hearing A Tribe Called Quest drop the babylon bombacl*t live on air at the GRAMMYs. The GRAMMYs hold a long tradition of being the awards program where musicians express themselves politically. Given the current political environment, it was no surprise that some performances were politically tinged. Katy Perry performed in front of a copy of the Constitution. Presenter Jennifer Lopez recited words by Toni Morrison but A Tribe Called Quest delivered the MOST political performance of the night! Biggup to A Tribe Called Quest, Anderson .Paak, Consequence, and Jamerican Busta Rhymes for their tribute to Malik “Phife Dawg” with their performance of a medley of “Award Tour,” “Movin’ Backwards” and “We The People”. As more people filled the stage in unity, the most powerful moment came when everyone suddenly bowed their heads and held up a fist while Phife Dawg’s verse blared over the speakers. But not before dropping the “babylon bloodclaat!” live on air! The group ended up with invited immigrants onstage joining in. Q-Tip then closed the performance with a simple, but potent message: “Resist! Resist! Resist!” Yaaaaas! This is what happens when artistry, political consciousness and free speech come together at the GRAMMYs. Mi luv dat! If you missed it…check it out before the GRAMMYs removes it.. 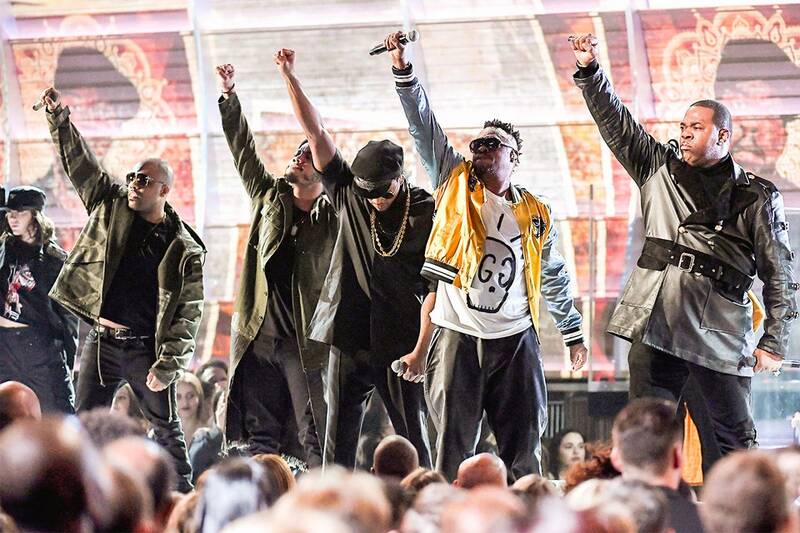 There are currently no comments on A Tribe Called Quest Gets Political and Drops a Bomba*%*t Live at the GRAMMYs. Perhaps you would like to add one of your own?